Right now, there are almost 300 million food photos on Instagram. For reference, there are 57 million travel photos and 69 million sunsets. It’s only pipped by selfies, of which there are currently 316 million (and counting). During a recent conversation about the photo sharing network, someone asked “why would anyone be interested in sharing photos of their food?” And it got me thinking. Why do so many of us feel compelled to share photos of our meals? With over six thousand spoken languages in the world and countless artificially constructed codes and communication systems; photography serves as one of the most universally understood forms of communication. Food deepens that communication, as it’s something that everyone can relate to. We all eat and have favourite dishes. It’s one of the few that everyone has in common. And now we have the technology that enables us bridge the gap between our dining experiences and shared lives. If I see a traditional Irish dish on Instagram, it always triggers memories of family meals and good times at home because there’s a level of nostalgia attached. Anyone who has ever moved to another country will know that sometimes, your favourite food might not be available and it makes you miss it way more than you anticipated. When I moved from Ireland to the UK, I didn’t expect a massive difference in food, however, I was a little saddened to find out my favourite potatoes to cook with aren’t available here. Potatoes in the UK are just not the same as Irish ones 😔 @Keoghsfarm where can me and @BarryGFarrell get your potatoes in London? While I can’t speak for everyone, I think it’s all about a universal experience. The people I interact with on Instagram are from all over the world and some of them don’t speak English as their first language. And even though I follow a lot of people for various reasons, a hefty chunk of those are accounts related to food. Whether it’s cooking, food styling and photography or the Great British Bake Off, I find the images to be equally as good at piquing my interest as they are at making me reminisce. Meals used to be a bonding experience where families or friends would eat together and talk about their day and whatnot; today, we live in a much more fast-paced society and that’s not always the way dinnertime pans out.People are eating on the go and or alone more often (which I happen to find enjoyable). I know I’m not alone in saying that I have gone for lunch or a coffee break on my own and enjoyed the food so much that I snapped a photo. Sometimes I’ll upload them on Instagram, sometimes Snapchat and other times I just send them to my friends or family. Whether they’ve been viewed by five or fifty people, every photo has triggered a conversation that I enjoyed having. Don’t get me wrong, I know that displaying our every move to the world through social media ends up with us losing dome of the intimacy attached to certain moments, but I don’t think that necessarily applies to food. When I find myself sharing a photo of my food, it’s more about sharing the wider moment. Just glancing through my feed, I can see pictures that show moments of solace, pride and accomplishment, excitement, celebrations and joy. And what’s the one thing all of these images have in common? They’re of food. 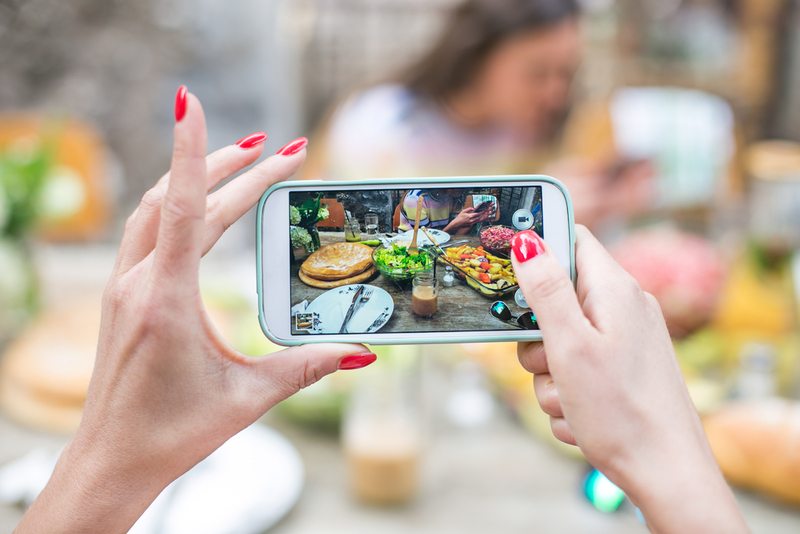 We wouldn’t complain about an artist posting photos of a finished work or someone posting their graduation photo, so why is food the subject matter of annoyance on social media? Food has been more than fuel for a long time. Think of occasions like Christmas, birthdays or weddings; a communal meal is a typical, if not essential, part of the celebrations. Eating for celebrations, whether it’s after a successful meeting or your birthday, is a cultural universal. And in today’s society, posting photos to Instagram, Facebook, Twitter, Tumblr or any other social network, is simply our way of sharing something meaningful, regardless of whether it’s a beautifully shot sunset or a rustic homemade pie. In the past we had family recipes, cookbooks and recipes online, sharing our food to Instagram is just the latest iteration of that movement. Have we missed someone? Let us know in the comments.